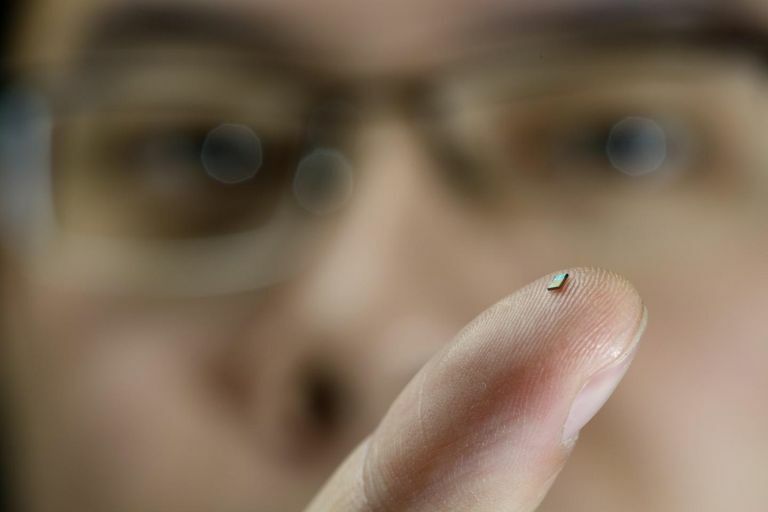 Minuscule sensors are nothing new - from tech thin enough to be embedded in your skin to heart rate monitors you can swallow like a pill, innovations in the field are coming thick and fast. Thing is, all these bits of technological wizardry still need a power source and that means adding on the pounds. But for a team of researchers based at the Eindhoven University of Technology, those battery-related worries are a thing of the past thanks to a miniature sensor that runs off the power of its own radio waves. And since it doesn't need a traditional power source component, it doesn't need wiring either so said sensor can be absolutely tiny (2 square millimetres to be precise). The sensor uses the wireless signal bounced back by a nearby wireless router to power itself up, but there is a snag - since it relies on radio waves the sensor must be 2.5 metres away. While this will make its commercial use a little less practical, the researchers behind the sensor, "expect to extend this to a meter within a year, and ultimately to 5 meters." The Dutch team are touting the strength of the signal as well, stating it could be applied to walls and surfaces with latex so it could still operate under a layer or paint.